The Victor Country is the perfect place from where you can reach the amazing beaches and discover the beauties of the Apulian sea. The Adriatic side is higher and has jagged cliffs, the Ionian side is filled with luxurious scrub and sandy beaches. No matter where you want to go, the starting point is the Victor Country, in the Apulian heart, that will allow you to reach easily any of the beaches you like. The Itria Valley, foremost the Victor Country, has strategic position halfway between the two sea’s. “Ask” the wind! It will tell which sea to go to. Discover the sea’s surprises. Secret bays and hidden caves or enjoy a cuddling atmosphere in a well-organized resort with clear sand. The most beautiful beaches are near Marine protected areas, where you will find true corners of paradise, rich in marine flora and fauna. 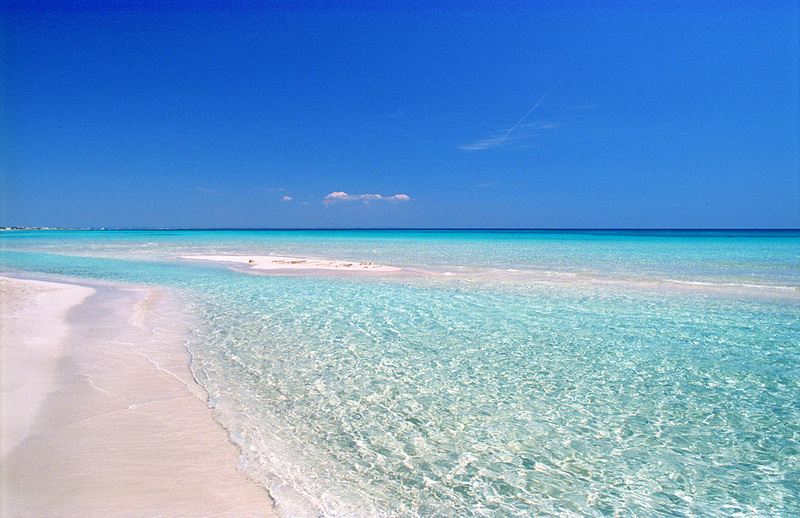 Crystalline waters overlook the clear sand stretches and small inlets, that are only to be found in Apulia. And for those who can’t standstill, our seaside offers many different ways to have fun: sailing, diving, windsurf, kitesurf and more. The Victor Country Hotel is close to the Apulian sea. Nay: near the seas. The Salento coast and the untamed beaches that reflect the sea colors is one of the must do trips for those who visit Apulia. Torre Guaceto represents one of the most beautiful beaches where you can plunge into a pristine landscape. 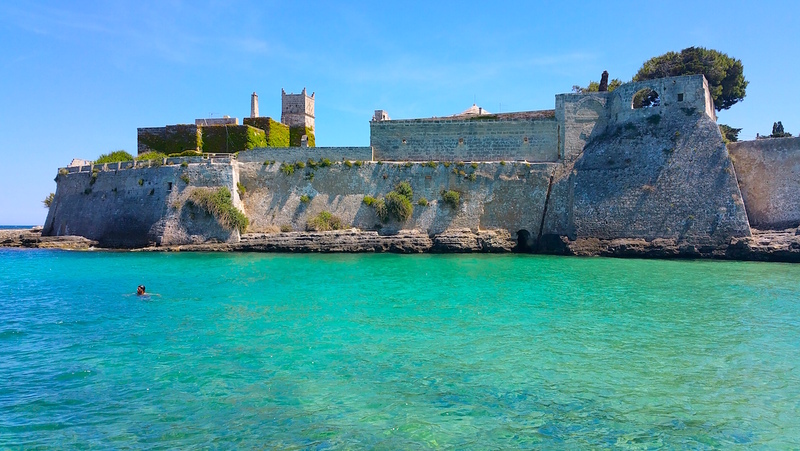 The Aragonese Castle, formerly Otranto’s defensive stronghold, is now the symbol of this magical land. The 8 kilometers of coast are a protected marine area, and here you will find also the Mediterranean Macchia. This undisturbed piece of nature allows you to enjoy the blue sea and its colorful seabed. Here you can discover a whole underwater universe with our diving trips, where you’ll be able to see galaxies of starfish, the diversity of the sea bed, the Posidonia oceanica (a seagrass species) and its importance to Mediterranean ecosystem. One of the assets of this beautiful coast line in Apulia is the vast assortment of different marine species and ecosystems. Another must see beach in Apulia is Punta Prosciutto. The soft and white sand, surrounded by the shallow and crystal water merge with the rocky and jogged coast line. Punta Prosciutto is a wonderful stretch of the Salento coast, part of the Municipality of Porto Cesareo an important Apulian touristic destination, thanks to the 17 kilometers of long and unspoiled beach, mostly public with some beach resorts. Punta Prosciutto is half way between Torre Colimena and Torre Lapillo. The name Punta Prosciutto has is origin in the local dialect “Li prisuddi”. The coastline of Punta Prosciutto inside the Regional Nature Park “Palude del Conte” (the Count’s Swamp) is a little corner of paradise in the heart of Salento. This area has a protected marine area and a former salt mine. Punta Prosciutto is also the perfect destination for those who love windsurf or kitesurf. South of Monopoli, on the way towards Capitolo, we have one of the most beautiful beaches in Apulia, Porto Ghiacciolo. The bay is to be found under the Antique Abbey of Saint Steven, and here is where you can find sand dunes and cold water springs that run along the coastline. This beautiful oasis of the Apulian sea discloses its unspoiled beaches with shallow waters and all the colors that go from emerald shades to deep blue. An enchanting corner of paradise where you can relax and enjoy the beauty of the panorama and all the services that the seaside facilities can offer.